They say if it’s not broke, don’t fix it. But when it comes to Hong Kong real estate, sometimes the rules go right out the window. Indeed, leaving its prime location at the Sunning Centre in Causeway Bay and moving up the road to Happy Valley’s South China Athletic Association base could have been the final nail in the coffin for beloved alfresco sports bar Inn Side Out – but, as we discover, all the right vibes have followed this bar to its new home. In fact, it’s a new and improved version of Inn Side Out at SCAA. More space in the alfresco area and more craft beers being offered up. But finding it is a bit tricky for those unfamiliar with the SCAA: without much signage, visitors need to know where they’re going – or get lost trying. Once you do find it, though, the first thing that strikes you upon entering the interior is the sound of merriment, just like the old place. Televisions screening the latest live games, guests enjoying themselves and the unmistakable sound of the thousands of peanut shells which litter the floor being crunched underfoot after patrons munch the nuts and toss the casing. The vibe is authentic, fun and punctuated by the occasional cries from sports fans. And, of course, there’s the alfresco drinking area which made Inn Side Out so loved in the first place. You can look out over the nearby golf driving range, watch the action going on in the kitchen or walk into the heart of the venue to find the bar. Which is what we do. 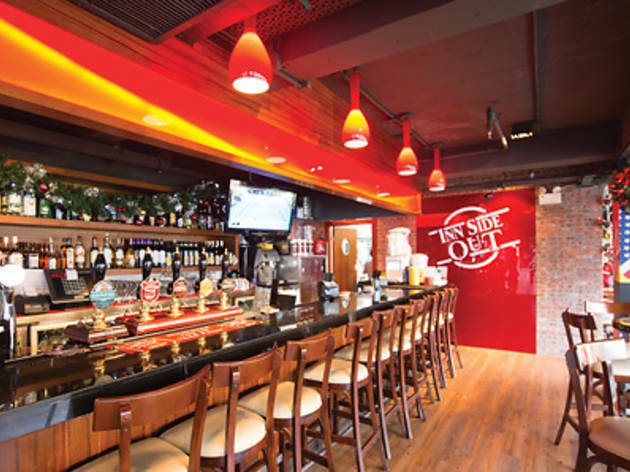 Inn Side Out’s new menu is similar to the old one with decent American pub food and, on the drinking side, an enviable list of American microbrews and Belgian imports. Indeed, the menu has been slightly expanded, featuring brews from Europe, USA, Mexico and Cambodia, while a beer from New Zealand also makes an appearance alongside European drafts. It is with one of these imports – the Well’s Banana Bread Beer ($60) – that we have our first taste of the night. Terribly playful, this dessert-inspired beer genuinely does evoke memories of the beloved comfort food, while other micro-imports also flirt with fruit and sweet-inspired flavours: like Lindemans’ raspberry, Floris’ chocolate and Hoegaarden’s Forbidden Fruit beer, making it a pleasure to browse the menu for ale anoraks and amateurs alike. The food here is great too. Contemplating a draft beer to follow, we dig into Inn Side Out’s nachos with chilli ($120). A classic litmus test for bar food, we’re happy with the nacho to chopped tomato to onion to cheese ratio. And, to top it off, or should we say under, the inner layer of nachos is as equally doused in melted cheese as the outer. The chilli fares well too – but more texture and a bit more spice wouldn’t hurt. Fans of the old venue won’t mind making the journey to the SCAA, while its tricky location could make it something of a hip, hidden spot for newcomers. The new Inn Side Out boasts a lively atmosphere, extensive drinks list, solid continental fare and that much-loved spacious alfresco area. It’s good to the point that even the staff are visibly happy to be hanging out. That’s the way it should be. 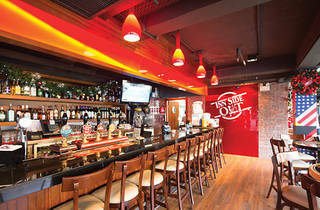 Inn Side Out 2/F, SCAA, 88 Caroline Hill Rd, Happy Valley, 2895 2900; elgrande.com.hk.